Zephyr Ridge Observatory, A Private Astronomical Observatory in Washington, USA. 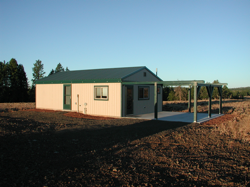 Zephyr Ridge Observatory is a private astronomical observatory located in eastern Washington. The design is a two-room, roll-off roof observatory. The larger room houses the telescope, and is fully exposed to the sky when the roof is open. The adjoining room is insulated and heated and serves as a warming room and sleeping quarters. The dark sky site (estimated Bortle class 2) of the observatory is ideal for deep sky astronomy. Currently the observatory houses a 20" Obsession f/5 reflector telescope for visual astronomy. The observatory was built in May/June of 2009. Details of construction can be found here. The observatory is named after Zephyrus, or Zephyr, in acknowledgement of the prevailing west wind. This observatory is the culmination of a long-held dream, and with this web site I hope to share what I have learned about building and managing a private observatory. I would also like to share my experience as an amateur astronomer. Thank you for visiting my site, and may your sky be clear and steady.